Bioluminescent Bacterium Kit is rated 4.0 out of 5 by 8. Light up your students' understanding of bioluminescent organisms. Students transfer Vibrio fischeri onto photobacterium agar, incubate the cultures in the dark at room temperature, and observe the bioluminescence the next day. Note: Store at room temperature, do not refrigerate or incubate. Use bacteria within 1 to 2 days of receipt for best results. 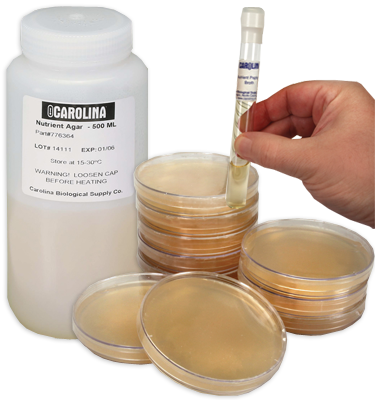 Keep bacteria culture in envelope until use. Rated 5 out of 5 by rosetta824 from Great kit! I am a 17 year old girl interested in microbiology. I purchased this kit two weeks ago and was able to successfully able to complete this kit. The directions were straightforward and simple, and it was fascinating to look at the bioluminescent bacteria. I would definitely order again. Rated 5 out of 5 by MeCl from Fabulous Ordered this for a demo of quorum sensing in a local middle school. Even after being shipped and sitting on my porch in the middle of a Nebraska winter cold snap all of our students were able to sub culture and see bioluminescence. They were SO excited! Thank you! Rated 4 out of 5 by DL341 from Easy to culture I bought this product for a small independent science research class. Students were able to culture the bacterial quite easily. They are hardy and easy to grow. The bioluminescence is faint but can be seen in a dark room. Rated 1 out of 5 by osazuwa from Product was ineffective The original culture was not apparent. After attempting to transfer to new agar tube, nothing happened. I suspect I was erroneously sent a package that had no living cultures. Rated 2 out of 5 by Casey from Before you commit to purchasing... I loved the idea of cultivating my very own specimens of Vibrio Fischeri. For one reason or another, Carolina Bio. was the only supplier of cultures I could find. When the cultures arrived, I followed the very vague and nondescriptive instructions. Instead of taking a max of 18 hours to begin bioluminescence, they took 3 days. Also, four tubes of agar were not sealed properly during the shipment process, and thus, the bacteria did not grow in these tubes. It was still neat to observe the bioluminescence, but I don't know. Maybe my expectations were too high. I would say that because of the lack of instructions, this kit should be labeled "medium difficulty," and/or the instructions really should be improved. It wasn't a terrible experience, but I believe it could have been better. If I knew a colleague who was interested in this particular specimen, I would probably suggest this kit and give him some advice on it. Rated 5 out of 5 by Bobo from quick and easy. Delightfully blue luminescence. Rated 5 out of 5 by underlircs from Creatures from "Avatar"! Kidding aside, this is a great product. Quite easy to grow, if only I'm allowed to keep them generating. Something fun for everyone to try, not just kids.